Emily, I think your are right, I have had liver damage from food poisoning years ago and I was never the same. My ND told me I had high amounts of benzine! Freakin fuel! I cleansed a lot of it out but I have many food allergies because of this and suspect it gave me hashimotos disease. I looked and looked for my chamo and must have thrown it out when we moved. So its just honey/water and 30 drops of lemon in my little vial. I finally got some raw honey and I think it stings a bit more. I will post as soon as I see a difference. How is yours going? Thank you for posting this! I learned of hypnotism to change the eye color a year ago but I'm too impatient for that sort of thing. It would probably yield quicker results combined with this method though. I'm gonna do a bit more research on this later. I'm already doing so much right now it seems >__<. Your welcome, and I heard of hypnotism for eye color but I couldn't focus enough for it. I wish you the best! Never heard of hypnotism to help change your eye colour. Strange, I wonder what realistic results from this might be. I'm kind of skeptical. Well, the batch I made for my contacts burns too much. Not because of the Chamo or turmeric, but because the actual lens solution burns my eyes too much. So I plan on making another batch with my good solution so I can soak my contacts in that. This one I'm just using periodically throughout the day as regular eyedrops. I forgot that a lot of people's eyes change colour from getting their colons cleansed. I'm still young, so it shouldn't make too much a difference on me, but I have had "regularity" problems since getting out of high school (even though I've adopted a healthier diet). I just started probiotics, so hopefully they will help (I'm VERY bloated from this problem; I look pudgy even though I don't have ANY fat on my midsection). If I can drop this excess waste, who knows, maybe I'll notice my eyes are a little brighter, too! 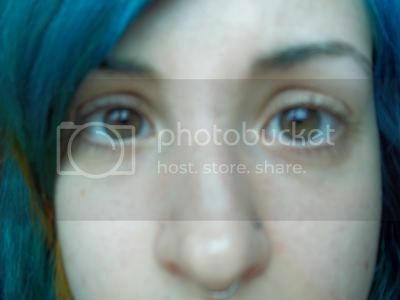 Looking more at my eyes, they are green on the outside and brown by the pupils. So as they lighten, the outer edges might lighten faster than the insides, and it'll probably be a more noticeable difference in the colour. Which is pretty exciting; I love eyes that are green or blue with brown spots in them! It's so dramatic! My boyfriend's eyes are a light green with light brown in them, and it's just so captivating. They still look brown from afar and in dark light, hopefully this will change. Still, they used to be black even in most light when I was younger, so I'm surprised they've come this far on their own! I'm also excited that my limbal rings are so dark, they're really gonna make my eyes stand out if I can get them lighter. Do you think limbal rings will lighten along with the iris? I sure hope not. I would love for mine to stay. So who knows maybe there is such thing as honey,gold ambery and green eyes. You can have light eye pigment (blue) in the second layer and lipochrome hues casting over it in the first layer( yellow) which van give a green eye. The first layer is one we can at least penetrate. So maybe my mom has green not blue and I am lifting my lipochrome hues which is why they seem like a dark bluish hue now. I really want to try cayenne pepper as I have fatty deposits located in the inner eyes I want to shrink. That's really interesting! Is it possible for someone to go from black to blue eyes? If so, how long has that taken? Black to blue is unheard of unless you are extremely toxic. And it would have to be in your genetics / true determined color since childhood. I guess you have to penetrate the deepest layer for it and I heard there is a laser that can do it. Until I find actual photo proof, I will say most likely not. But even then, how would one tell if it is photo-shopped? It is possible to go from having black (extremely dark brown) eyes to blue eyes - but you'll need laser surgery. It's probably expensive, but it is possible. I remember seeing a segment on the news about a woman having the surgery and opting to have one eye done at a time and thinking she looked quite strange with one blue eye and one dark brown/almost black eye. But will it kill off the limbal rings Lol!